Hola Lexicans! So as Autumn is officially here, I've been planning a range of autumnal posts and when I was doing this, I thought to myself 'What Do I Think Of When I Say Autumn', and one of the first things was a cosy night in. A couple of weeks ago, my family and I watched a film (Pete's Dragon) together which we loved, so I thought for this post I would do a mini review on Pete's Dragon, plus talk about how to prepare for a cosy autumnal movie night in. Also, this post is really exciting, as it is a collaboration with whichmovienext.com - a really cool company that gives you recommendations of other movies similar to one you may have recently enjoyed. 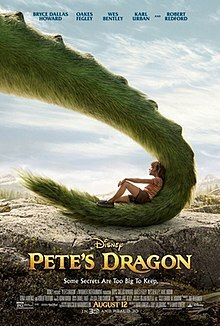 So if you haven't already heard of Pete's Dragon (according to my sister it is really famous but I hadn't actually heard of it until we watched it whoops aha) basically it is about an 11 year old boy who was orphaned as a toddler and has stayed on this island by himself, with only one thing as company - a dragon he named Elliot - for years without being noticed. Until the daughter of a lumberjack crew member spots him and tells her dad. I won't tell you anymore as I don't want to spoil it, but it does involve the authorities getting involved and them trying to tear Pete away from his beloved pet dragon. I really really enjoyed this film. The first thing to note, is that I am not a big fan of fantasy (*readers gasp* *readers boo* yess I know, many of you are fantasy fans, but I am not #sorrynotsorry) but I still loved the movie. I thought, particularly from the title, that it would be all about the dragon, and from a fantastical point of view, but really it was more of a heart-warming, emotional story about the boy (which I do love!). I nearly cried at various points in the film, but in the end I felt super happy and flipping loved the finish. Would definitely recommend this as a family film, if you like a bit more emotion and depth than your classic Disney movie. 1. FOOD (obviously!!) My personal faves for movie nights are twirl bites, salted popcorn and chocolate buttons! Also, make a hot chocolate or cup of tea to drink during the film! 2. Light some candles - particularly now it's autumn, it just makes it feel way more cosy. 3. If you have a fireplace, light it! Once again, it really adds to the cosy, autumn vibe. 4. Collect together all the throws and blankets you can find to keep you warm. 5. Wear your comfiest clothes - for me, my onesie or an oversized sweater with pyjama bottoms. So those are my 5 things that make any autumn movie night 109393920x better:) Thanks to whichmovienext.com for partnering with me on this post! Have you watched Pete's Dragon? What did you think? What are your necessities for movie nights? Note: This post is sponsored, but all words and opinions are my own. I also didn't hear about Pete's Dragon until I watched it so don't feel bad! I loved the movie though. :) It was one of those movies that kind of made me smile at how fun and innocent it was. Cool review Lexie! Nice post Lexie! Definitely agree with you on how important food is for a movie night. I really love caramel popcorn.